Extension cords are an “extension” of our home’s electrical system, and are an essential item to have around the home, yard, or garage. We use them for everything from the connection of some temporary decorative lighting (i.e. Christmas lights), to extending the power supply to facilitate the use of tools such as electric hedge trimmers, lawnmowers, and construction tools. 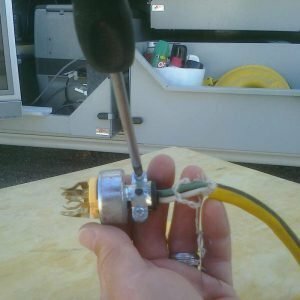 In this post, I review considerations for proper selection of an extension cord, and provide step-by-step instructions for repairing a damaged extension cord. An extension cord, power extender, or extension lead is a length of flexible electrical power cable (flex) with a plug on one end and one or more sockets on the other end (usually of the same type as the plug). For a more detailed explanation, and some additional valuable information on the use of (and where they are not to be used) here is the url for the post from the good folks at wikipedia: http://en.wikipedia.org/wiki/Extension_cord. When choosing the correct extension cord for the application, here are some things to consider. 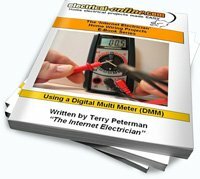 Ensure the cord is of sufficient size to supply the tool or electrical load that you will be using. The more current you need, the larger the size of the cord. The longer distance you need, bigger is better as well. What type of cord do you need? 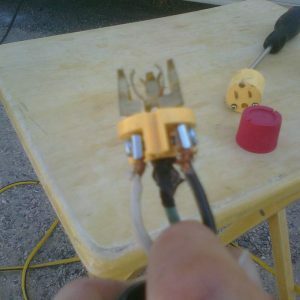 Indoor or outdoor, wet or dry conditions, any contaminants present that may damage the cord (i.e. oil, grease, etc.). Always choose the correct extension cord for the application. All cords are rated for their conditions for use. 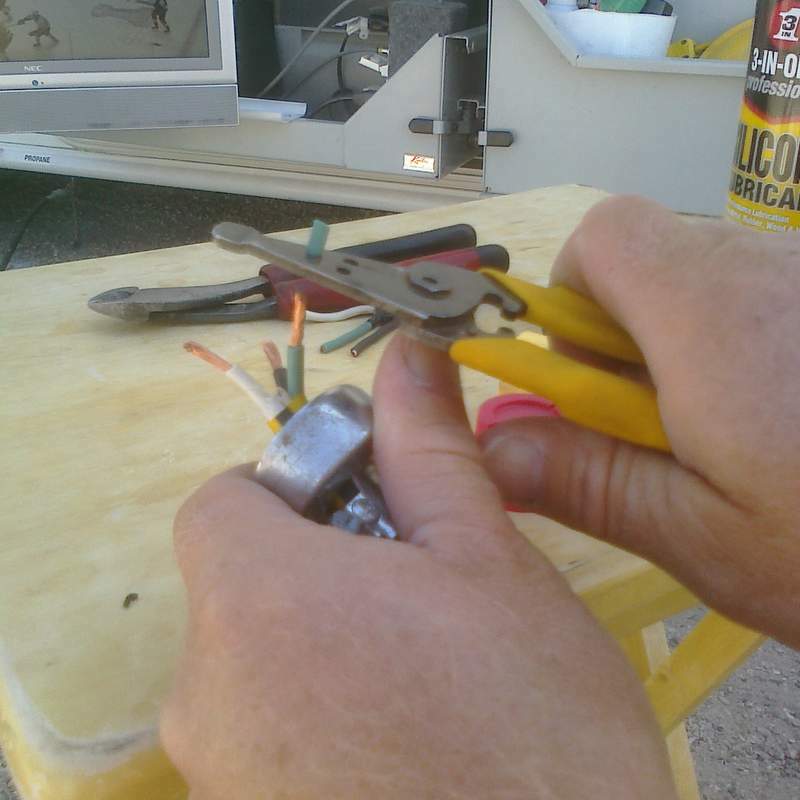 Last but not least, inspect the extension cord to ensure that it is in good condition. 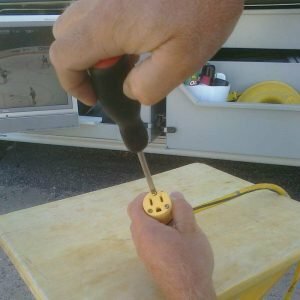 In this post I am going to focus on the repairing of a cord that needed attention! While here in Puerto Penasco, Mexico, I was having some cosmetic repairs done to my motorhome. One of the cords that the guys were using for everything from running the air compressor, to their power hand tools, was in poor condition. I decided to fix this up for them, and capture the project for a useful post on the website. Upon inspection of the cord, this was one that was assembled using a plug (male cord cap), a female end (connector body), and a length of SJTW flexible cable – all the components of an extension cord. The cord itself was in good condition, as was the male plug on the other end. The female connector body itself was in good shape as well, but whoever installed this on the end of the cord did a very poor job. I also checked polarity, and the tester indicated a hot-neutral reverse. To begin, of course the first thing to do is ensure that the male end is not plugged into an outlet. Then I removed the screws in the face of the cord end. Then I loosened the cable clamp screws. The clamps should be tightened firmly down on the exterior jacket of the cord, not on the single conductors as was the case. Then I pulled back the housing to reveal the poorly done connections to the terminals of the cord cap. 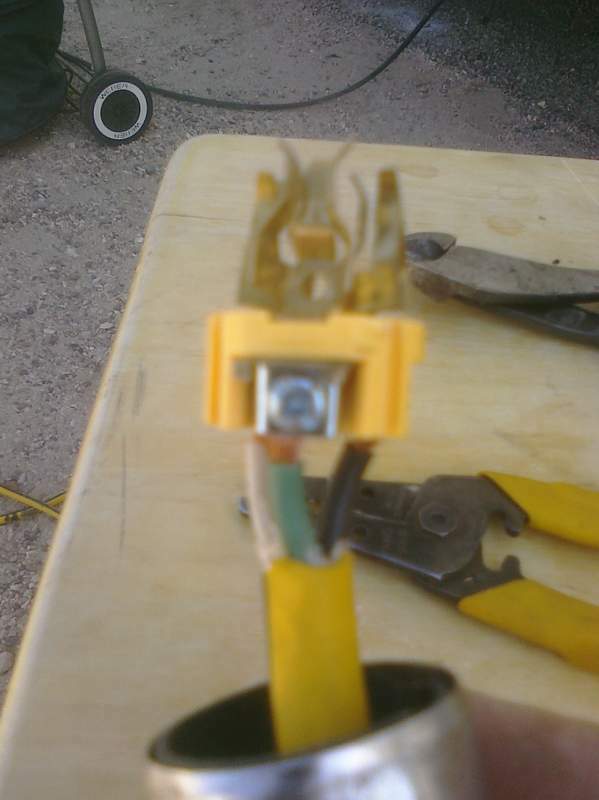 I found the white wire connected to the hot terminal, and the black hot wire was connected to the neutral terminal, the source of my hot-neutral reverse condition. The terminals were in good condition, and the metal at the connection points showed no signs of heating, arcing or any physical damage, so all I needed to do was to make a proper installation of the cord cap to the extension cable to make this cord safe to use. I trimmed up the exterior jacket of the cord, and cut over half of the exposed conductors off so I could re-strip them, and so that the exterior jacket of the cord will extend beyond the cable clamps and into the connector itself as it should. Then I connect the wires under the terminals, green to ground, white to silver, and black to the brass one. 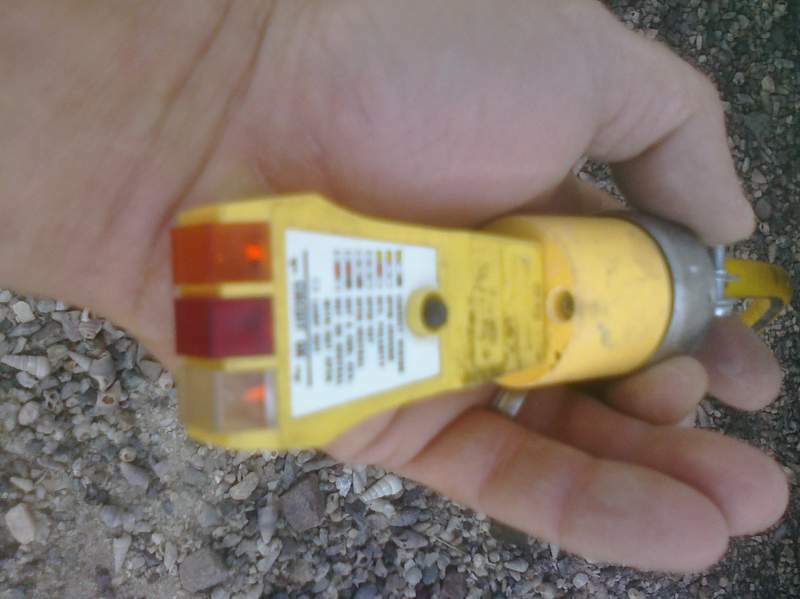 When looking at the face of the female cord cap with the ground at the bottom, the hot wire is on the right (narrow slot), the neutral on the left (wider slot). Now that the terminations are done properly, the housing base can be slid into place and the face of the cord cap screwed back onto the base. Then tighten the cable clamps, and the repair is complete. Then I used my plug tester and checked the outlet on the pedestal to make sure that it tested correctly before plugging the tester into the newly repaired cord end and all checked out OK. 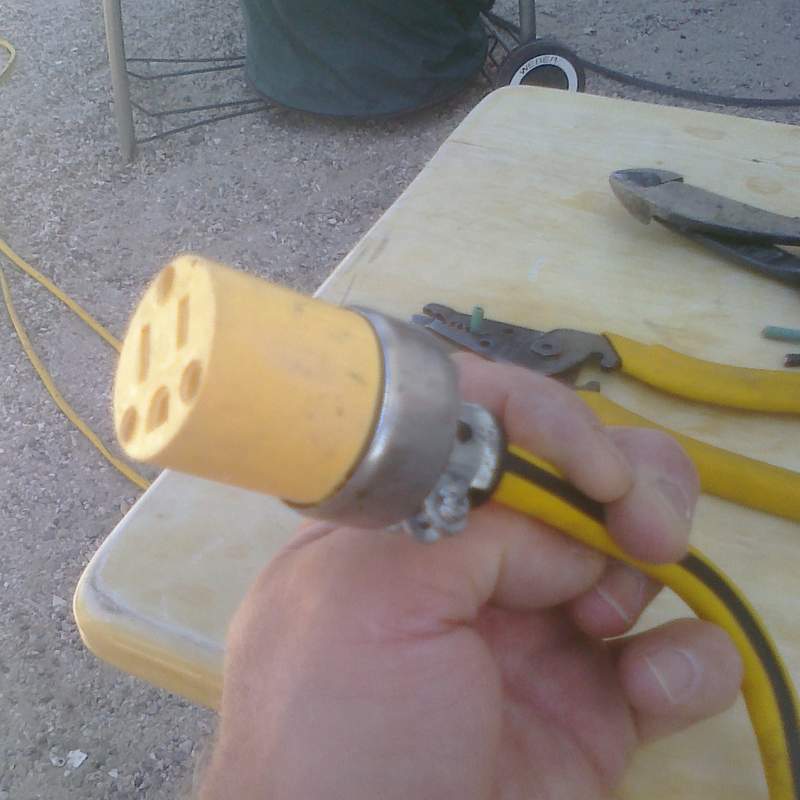 This is just an example of one of the simple repairs to electrical equipment that can be done around the home safely, and effectively reducing a potentially hazardous situation like this extension cord presented. If you see a cord in the same condition as the one in this post, take the steps to rectify the situation immediately, or if that’s not possible, unplug the cord, and take it out of service, preferable by cutting off the defective end to render it unusable until the cord can be repaired properly, or replaced if needed. 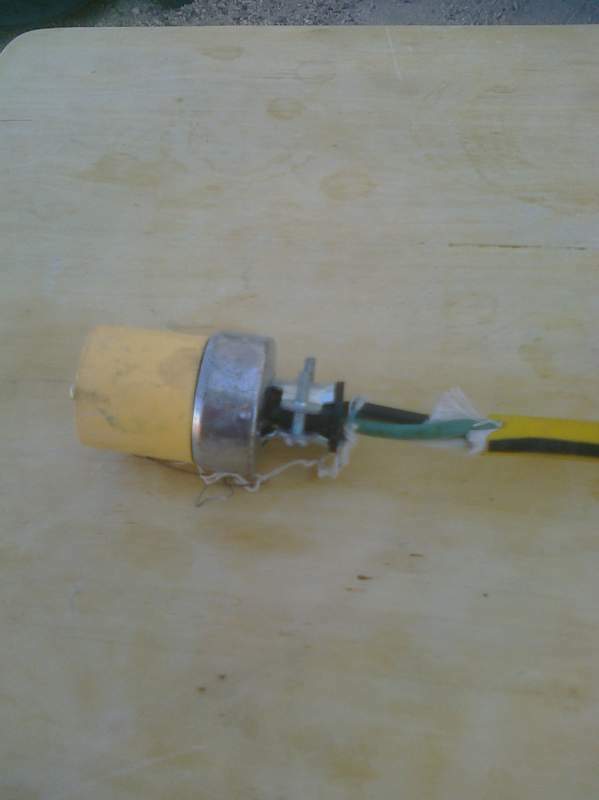 This entry was posted in Electrical Wiring, Outdoor and tagged cord, extension cable, extension cord, extension cord repair, female connector body, female cord cap, male cord cap, outlet, SJTW cable. Bookmark the permalink.